The Clipper transit fare payment system is moving to a new technology platform, known as Clipper 2.0. To make transit more appealing and affordable, and to make it easier for riders to use many transportation modes and operators, it’s crucial to do the hard work of simplifying and coordinating fares before the big move. Photo by Sergio Ruiz for SPUR. When you move to a new house, it might be tempting to put everything — the clothes you haven’t worn in years, old electronics, random sports equipment — into boxes and sort it all out when you get to the new place. But your conscience, your relatives and advice columns will all tell you that it’s better to recycle, donate or throw things out before the move. The more unneeded things you get rid of, the less you need to pay for movers and the easier and faster it will be to unpack. Plus, you’ll be in a better position to set up the new place the way you want it. 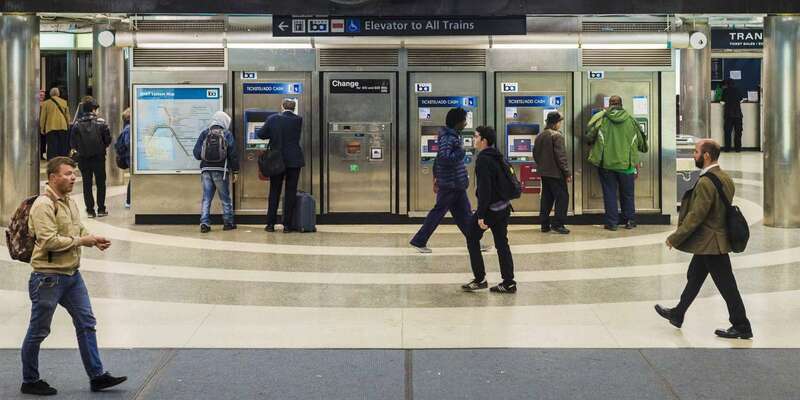 This simple truth applies to moving technology platforms as much as it does to moving houses: Clipper, the Bay Area’s transit fare payment system, is getting an upgrade and moving to a new platform, known as Clipper 2.0. This month, the Metropolitan Transportation Commission (MTC) selected the “movers,” who as of now will be tasked with moving every shoe, book and magazine — 35,000 business rules reflecting all of the transfers, discounts, promotions and other fare variations among the Bay Area’s 27 different transit agencies — to Clipper 2.0. According to industry experts, MTC and transit operators could save $3 million to $4 million in the design and development of Clipper 2.0 — and millions more throughout the lifetime of Clipper — if they downsized before the move. This means streamlining fare policies, those 35,000 different rules that govern how much people pay for transit. Fare policy is the building block of Clipper, and in the Bay Area it’s complex. Each transit operator set its own fare policy, resulting in a hodgepodge of different fare structures, products, discounts and prices across the region. The Clipper card acts as a mask, covering up a complex web of fares that make navigating transit inefficient, cumbersome and costly. Beyond saving money and improving reliable delivery of a major project, a streamlined fare system could make transit more affordable and increase ridership, making it easier for public transit to compete in an era of rapid private-sector innovation in transportation. Fare streamlining would make software developers more likely to develop solutions that will work across transit operators, and it would make it easier to execute loyalty programs that reward frequent transit use across operators. As a technology platform, Clipper 2.0 will provide the level of functionality required to integrate with other travel modes and services, like bike sharing, scooter sharing and even ride sharing. The barrier to getting there isn’t technology, it’s policy: Getting the most out all the new features Clipper 2.0 can support requires simplifying and coordinating fares. The need to simplify and streamline fare policies came up when MTC kicked off the Clipper 2.0 upgrade. Prior to issuing the call for a new system integrator to design, build, operate and maintain the system, the agency put out a request to industry experts for feedback on the proposed design for Clipper 2.0. Included among the responses was a recommendation that the region simplify its fares in order to get good value from the upgrade. But this suggestion was not heeded. Cubic Transportation Systems, Clipper’s current system integrator, was the lone bidder for the job. This month, MTC announced the selection of Cubic as the new system integrator. According to an MTC staff report, one of the reasons other companies opted to not bid was because they were discouraged by the complexity of the region’s fare policy. In short, fare policy — not technology, not software — made Clipper 2.0 a less competitive contract. The Clipper 2.0 process has made it abundantly clear that MTC and transit operators cannot continue to overlook the impact fare policy has on Clipper’s appeal to riders and its costs to MTC and transit operators. Five Ways to Simplify Fares Before the Move to Clipper 2.0. The design and build phase of Clipper 2.0 — when Cubic will get to work “moving,” or recoding the existing rules in the new system — will start in approximately two years. (In the first two years, Cubic will be busy developing a mobile app and upgrading existing readers and other equipment.) This means there’s enough time to make meaningful changes to fare policies before the move begins. The following recommendations, along with other ideas for how to improve and enhance the region’s fare policy, will be published in a SPUR white paper later this fall. 1. Standardize Clipper transfer discounts. 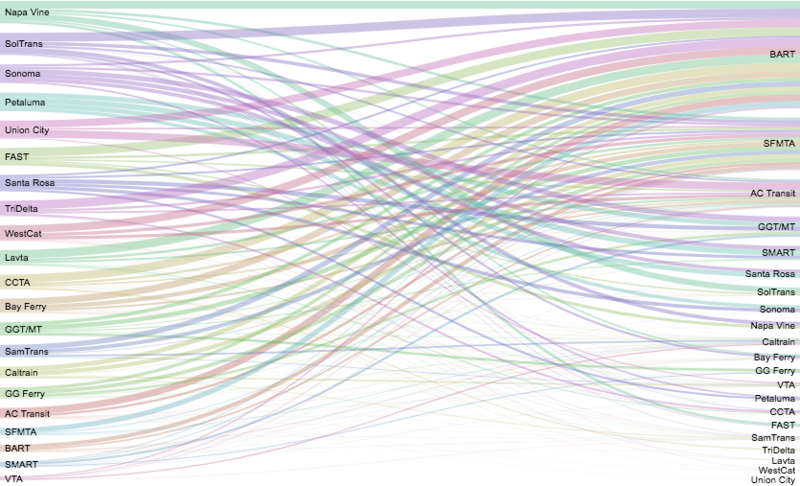 The variety and complexity of the transfer policies in the Clipper system are one of its largest cost drivers. Transit operators offer a host of different discounts to riders who transfer between buses, trains or transit operators. These discounts can vary by time or based on the route or fare category (i.e. for adults only). Because each transfer policy is unique, it requires its own line of code in the Clipper system. This adds unnecessary complexity with little justification — either economically or in shifting travel behavior. With so many transfer discounts, it’s unclear the extent to which they are actually incentivizing people to transfer. Many transfer discounts aren’t well used: In 2017, for example, only 85 Clipper rides triggered the Caltrain to AC Transit transfer discount. Transfer discounts should be approached strategically to support the use of transit as a network. MTC and transit operators should develop standard transfer discounts for the region. Creating a flat transfer rule offers a better rider experience, while at the same time reducing engineering and testing time. 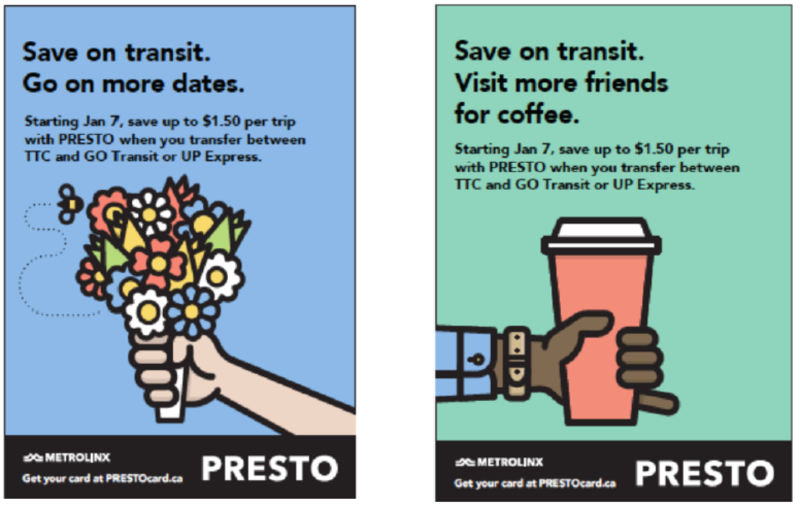 Metrolinx, the planning agency for the Greater Toronto Hamilton Area, launched a marketing campaign to advertise a new transfer discount. Publicly advertising a transit discount to promote the use of the transit network has not been done in the Bay Area. Images courtesy Metrolinx. 2. Standardize fare categories and their discounts. Fare discount categories (low-income, youth, senior, disabled, etc.) and their discounts should not shift from operator to operator or city to city. BART recently expanded the eligible ages for its youth discount from ages 5–12 to ages 5–18. BART’s effort is notable and is helping achieve consistency in the youth fare categories. Nevertheless, discrepancies remain. For example, the percent discounted off of qualifying rides varies significantly throughout the region. Standardizing the definitions of the categories and the discounts themselves would make the cost of a ride more predictable and support transit use by different groups. The Clipper discount for youth varies dramatically throughout the Bay Area. It ranges from as low as 5 percent off of the adult fare on Sonoma County Transit to as high as 54 percent off on VTA. 3. Replace the minimum balance requirement with a “one more ride” benefit. Transit operators require Clipper card users to maintain a minimum balance on their card at all times. The minimum balance requirement varies throughout the region and is as low as $0.01 for some transit agencies and as high as $6 for others. MTC’s Means-based Transit Fare Study found that the minimum balance requirement is a point of frustration for riders with low incomes because it means that their money is inaccessible and because they have to be mindful of the various minimum balance requirements when switching operators. Removing the minimum balance requirement and replacing it with a “one more ride” benefit can make transit more accessible to riders with low incomes. This benefit allows riders to make one more trip even if they don’t have sufficient funds, as long as they have a positive balance on their fare card when they board. Riders must add more funds to clear the negative balance before they can use their card again. The "one more ride” benefit ensures that riders are never stranded without a payment option. Several Bay Area transit operators have expressed interest in accepting Clipper as their only payment option. (Riders could still use cash to reload their Clipper card, but they could not use cash to purchase a paper ticket or to pay on board a bus.) There are many benefits to moving to payment by Clipper only, including: the reduced costs of cash handling, less need for complex ticketing machines that can process both Clipper payments and paper tickets, and faster boarding, as non-cash transactions are quicker than cash. Other regions that have transitioned to cashless payment have demonstrated that relaxing the minimum balance requirement and allowing riders to go negative for one ride is a necessary step to making a cashless system work. 4. Reduce the number of fare passes and replace some with fare capping. According to SPUR’s research, fare products that are specific to a transit operator, such as monthly passes, undermine the interoperability of the Clipper system, complicate the marketing of Clipper and drive up system costs. Clipper supports more than two dozen different passes and, like transfers, many passes are not well-used. According to our analysis of Clipper data, over the last four years, more and more transit riders are opting to pay for transit with “e-cash” (cash value on their Clipper card) as opposed to with a pass product. In many cities around the world, the introduction of smartcards to pay for transit fares has resulted in the elimination of traditional passes, which have been replaced with daily, weekly and/or monthly “fare capping”: Riders pay for each ride up until their accumulated fares reach the rate of a transit pass and then are not charged further. Fare capping ensures that all riders get the lowest price for transit, not just those with the means to purchase a pass upfront. Passes that have been successful in gaining widespread use should transition to fare caps under Clipper 2.0. That said, while there are many advantages to fare capping, riders should not be tasked with remembering a host of different fare caps, one for each transit system. Fare caps should be standardized across operators, and fares should accumulate across operators to support and encourage use of the region’s entire transit network. 5. Launch a business case for fare integration. Simplifying fares is an important first step, but to encourage and support the seamless use of multiple transit services, the region’s transit operators also need to integrate their fares. Transit riders should experience a common fare structure throughout the region, a standardized user experience and fare products based on the trips they take — not the transit agencies they use. The region’s fare policy should encourage — not penalize— riders for making transfers. Riders want integrated fares: making it easier and more affordable to ride multiple transit systems was on one of the top five recommendations MTC received from the public as part of its Future of Clipper outreach program. This shouldn’t come as a surprise, given the extent to which people use multiple transit operators to move around the region. 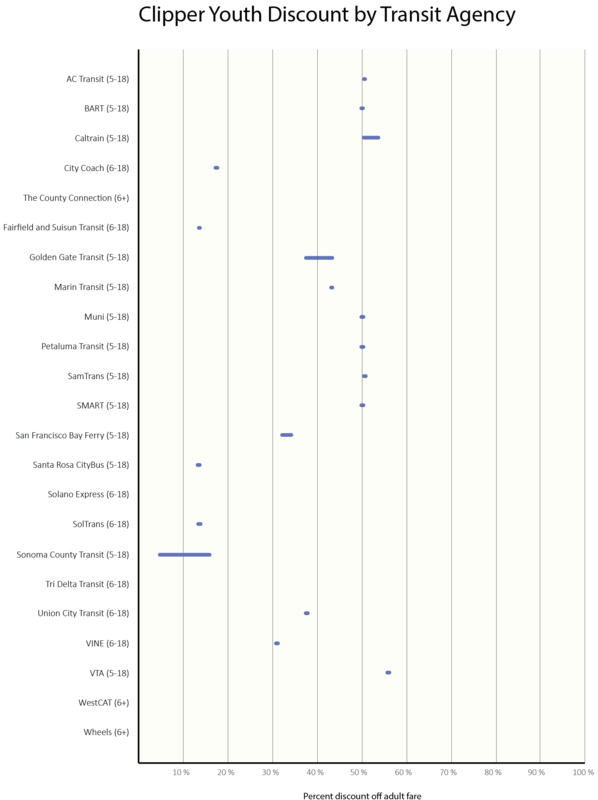 Transit riders who use one system are also frequent users of other transit systems. For example, in 2017, 22 percent of Clipper Card riders who rode FAST also rode Muni. Source: Analysis by MTC using Clipper card fare payment and pass validation transactions between 3:00:00 AM PST on 1 January 2014 and 2:59:59 AM PST on 1 January 2018 inclusive. This chart shows 2017 data only. MTC and transit operators should launch a business case for fare integration. The business case would consider the merit of various options for fare integration as compared to the status quo by assessing the impact of the options across different objectives, such as relevant policy goals and targets and potential to realize economic value and support ridership growth. In the absence of real information, fear and assumptions are driving the decision to maintain the status quo. A business case for fare integration would help the region understand and assess the advantages and drawbacks to regional fare integration. There is no good reason to saddle Clipper 2.0 with all the complexities and limitations of current fare policies. Other regions that are in the process of upgrading their fare payment technology have streamlined and simplified fares and created new, multi-operator fare products before transitioning to their new system. As everyone who has moved house knows, sorting through all your belongings is difficult. And it’s even harder when there are multiple people in the household who have strong opinions and feelings about different belongings. Sure, it’s easier to put everything into boxes. But if we’re going to be an innovative region, able to take advantage of advances in technology and offer riders an attractive customer experience, we need to be more thoughtful and strategic about how to approach fare policy. MTC and transit operators need to do the hard work of evaluating existing fare policies to uncover what’s working, what’s not working and why. They need to set goals for what transfer policies, discounts and products should achieve for riders, for transit operators and for the region, then design policies, discounts and products to meet those goals. It’s time for transit operators to simplify and coordinate their fares.